Beautiful truck with no rust body. 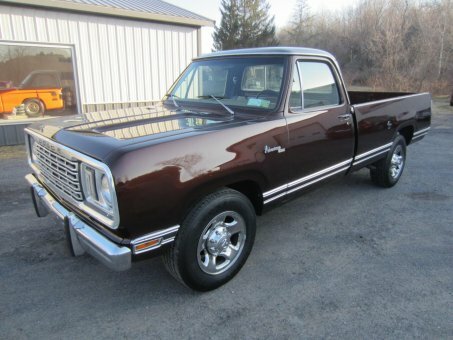 with an updated paint job in new ram western brown. truck is a 400 big block truck with a new 4 barrel added. truck as aftermarket a/c unit, cb radio and trailer hitch.to make a show stopper truck could use seat repaired, a new carpet and a rear bumper. has a few pinholes in floor mostly near gas pedal as is common with this vintage dodge trucks but very minor and nothing u would fix. front grill is driver quality but with the outstanding paint and body could use to be updated.truck runs and drives excellent. stored in my showroom and does drip a little oil as most old mopars do.